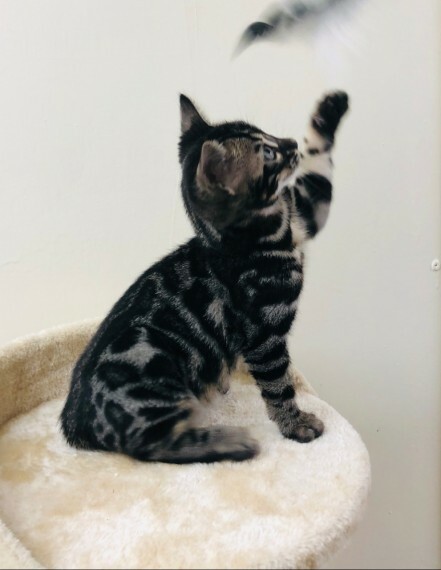 We have two stunning litters of pedigree Bengal kittens for sale ready to go 1st December 2018 when they are 13 weeks old. We have both girls and boys available with exquisite colours and patterns. including Marbled. We have some stunning Charcoals and all the kittens are highly glittered making them really shimmer under the lights. They have fabulous temperaments and are playful and loving. the kittens are already exploring and climbing and are very bold. They love to curl up in your lap for a cuddle too. They are being raised with love in our family environment and are used to children and other pets. They can be seen with both their parents who are health tested PRA and PK Def normal. As I am a Registered Veterinary Nurse. their health is of the utmost importance. All kittens will have had a full course of vaccinations. up to date with flea and worm treatment. microchipped and come with 4 weeks free insurance. They will also come with a kitten pack containing food. a blanket with mums scent on and lots of goodies and information on caring for your new baby.